← Should I Have Been a Pastor? Earlier this week a very prominent (and much better than me!) brass player asked in an online forum if the Valsalva maneuver was still a problem seen with brass players, as he had not heard much about it recently. As I and several others replied, it is still very much a “thing,” one that can be rather challenging to address with students. The Valsalva maneuver is a bodily function in which the airway is closed and a forced exhalation against that closed airway is attempted, often as a means of gathering strength for heavy lifting, defecation, or childbirth. While this is not necessarily harmful in those instances, performing this action during brass playing has a deleterious effect upon one’s music making, causing delayed attacks, a telltale “grunt” upon articulation and sometimes even when slurring, and an overall tense approach to the instrument. In extreme cases, use of the Valsalva maneuver while playing can contribute to the development of disorders such as focal dystonia. Happily, the process of eliminating use of the Valsalva maneuver is simple to describe and, in theory, to execute. The challenge lies in the difficulty of changing one’s fundamental approach to the instrument, the necessity of unwinding sometimes a great deal of unnecessary tension, and the long-term repetition of these steps required to make the new approach the one which the player employs instinctively. The steps I will describe below can be undertaken immediately, and yet must be performed repeatedly over a long period of time in order to realize lasting success. Recognize and acknowledge the problem. Often students who enter my studio using the Valsalva maneuver when playing are not even aware that they are doing so. They might be vaguely aware of tension or inefficiencies in their playing, but do not hear the “grunt” or feel the tension in their throats—after doing it this way for so long, the sometimes painful feeling of throat tension is perceived as normal by these students. Recording students so that the tension can be observed and the grunt heard (microphone placement is important here) can help, though often it is only after experiencing relaxed playing even briefly that students realize that there is another, better way. Understand that using the Valsalva maneuver is a manifestation of a larger timing problem. Practice breathing and blowing without the instrument. Moving on to more concrete steps, have the students breathe and blow through their exercises and pieces without the instrument. Everything else should be the same: use the metronome, emphasize inhaling and exhaling without pause, and even insist on blowing the amount of air that would be used when playing the passage. Move the valves or slide as would be done with the instrument, and articulate normally, but with no instrument (“air trombone!”). The vast majority of students will not continue to use Valsalva apart from the instrument (I have only had one who did), so this is a good way to help the student become acclimated to the feeling of freedom in the throat and of breathing and blowing without pause. Practice breathing and blowing (but not buzzing) with the instrument. Next, repeat the above step with the instrument, but still without actually buzzing (in other words, “air play”). The object here is to repeat the feeling of good timing and freely blowing achieved in the previous step, but this time while holding and manipulating the instrument normally, sans buzz. Some students might begin to display Valsalva symptoms in this step, but it is much more noticeable to them when there is no sound coming out of the instrument. Starting again and perhaps repeating the previous step is necessary when this occurs. Play the passage, maintaining the feeling of the above steps. Finally, have the student play the exercise or piece, still with the metronome, and trying to maintain the freedom of breathing and blowing achieved in the previous two steps. Chances are this will only last a couple of bars at first before the old habits begin to reassert themselves, but with persistence occurrences of the Valsalva maneuver will become more rare over time. Again, regular repetition of these steps over an extended period will be necessary in order to eliminate the problem, as well as to address “flare-ups” that might occur throughout a person’s career. Like so many poor playing habits, use of the Valsalva maneuver can recur if one does not mindfully and deliberately take steps each day to reinforce correct playing habits. Use of a thorough daily fundamentals routine is a helpful part of establishing, building, and reinforcing good habits because this provides an opportunity to focus upon playing correctly without devoting mental energy to processing and executing the music in front of you. 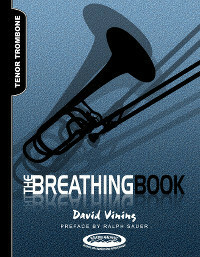 Those prone to Valsalva and other types of excessively tense playing might find regular use of The Breathing Book by David Vining to be helpful, as well. Micah Everett is Associate Professor of Music (Trombone/Low Brass) at the University of Mississippi, Principal Trombonist of the North Mississippi Symphony Orchestra, Bass Trombonist of the Great River Trombone Quartet, Assistant Editor (Audio/Video Reviews) for the International Trombone Association Journal, and an S.E. Shires trombone artist. He is the author of THE LOW BRASS PLAYER'S GUIDE TO DOUBLING, published by Mountain Peak Music, and released his first solo recording, STEPPING STONES FOR BASS TROMBONE, VOL. 1, on the Potenza Music label in 2015. In addition to his professional work, he maintains an avid interest in the study of the Bible and of Reformed theology. He holds doctoral and master's degrees in music from the University of North Carolina at Greensboro, a bachelor's degree in music education from Delta State University, and a certificate in systematic theology from Puritan Reformed Theological Seminary. The ideas and opinions expressed here are not necessarily shared by the employers and organizations with which the author is associated. This entry was posted in Alto Trombone, Bass Trombone, Breathing, Daily Routine, Euphonium, Low Brass Resources, Music, Music Education, Playing Fundamentals, Practicing, Tenor Trombone, Trombone, Tuba, Valsalva Maneuver. Bookmark the permalink.